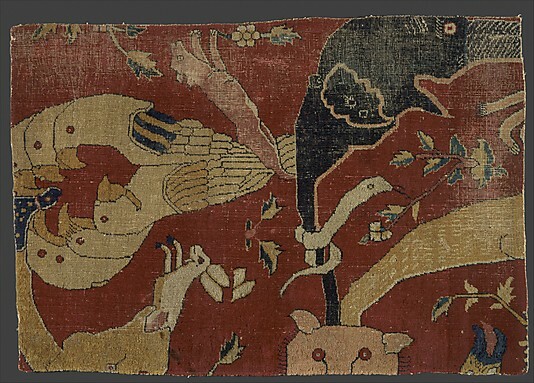 This carpet, with its pictorial depiction of trees, birds, and animals, is conceived like a textile with a repeat design in which each unit reverses the direction of the preceding one. 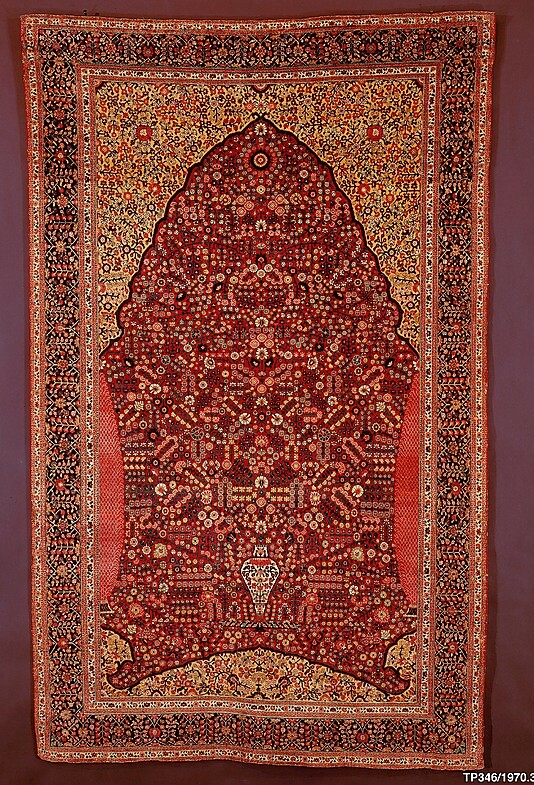 The ibexes, Chinese mythological beasts called qilins, and animals in combat, are derived from Safavid Persian art, as is the border design of cartouches and star-shaped medallions with cloud bands. 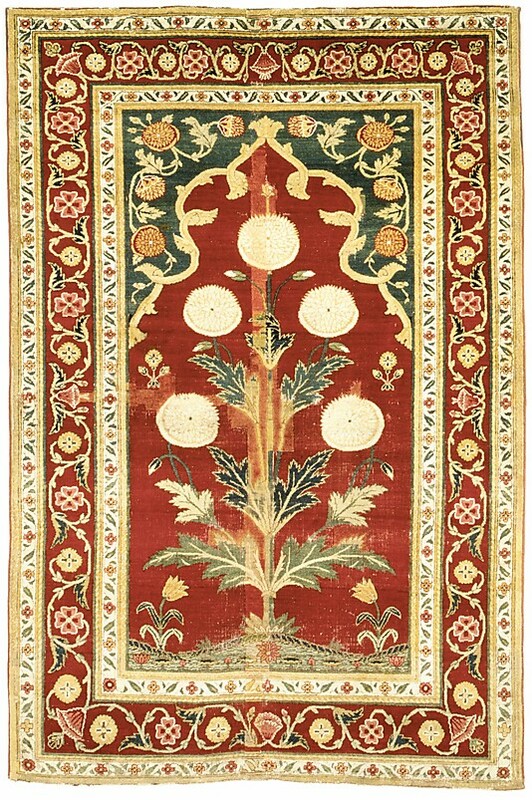 The palm tree, however, is a very Indian feature, as is the generally naturalistic drawing of the flora and fauna and the bright red color of the field. 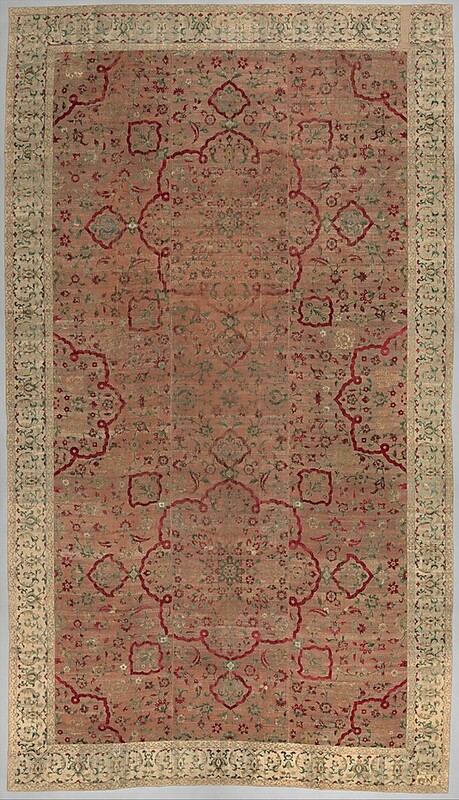 The relationship to Persian carpet design dates this example to the early Mughal period, soon after the first carpet workshops were established by the emperor Akbar in Lahore, Agra, and Fatehpur Sikri. 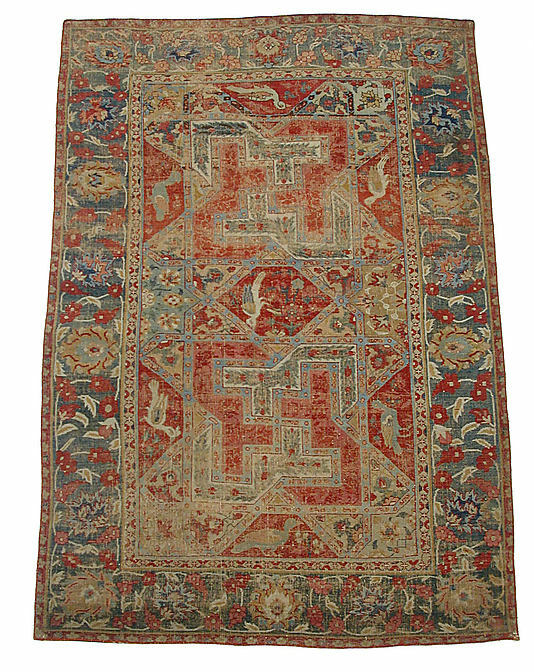 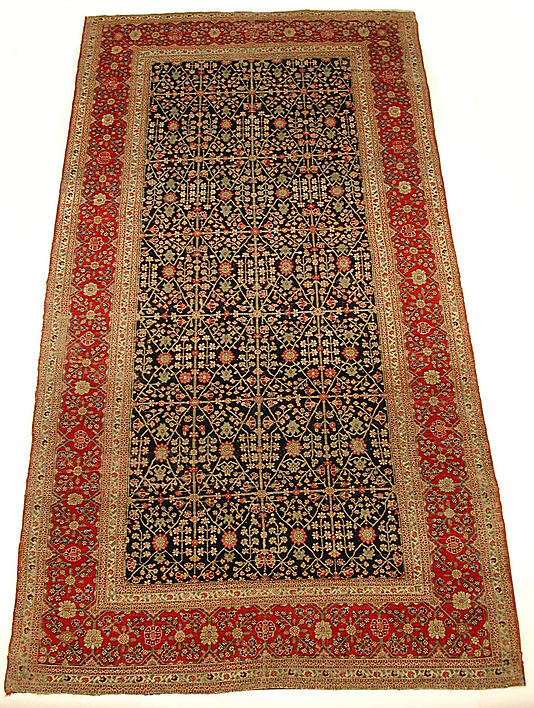 The finest Indian carpets were made with a pile of pashmina wool and a foundation of silk, which allowed for hundreds of knots to be tied per square inch. 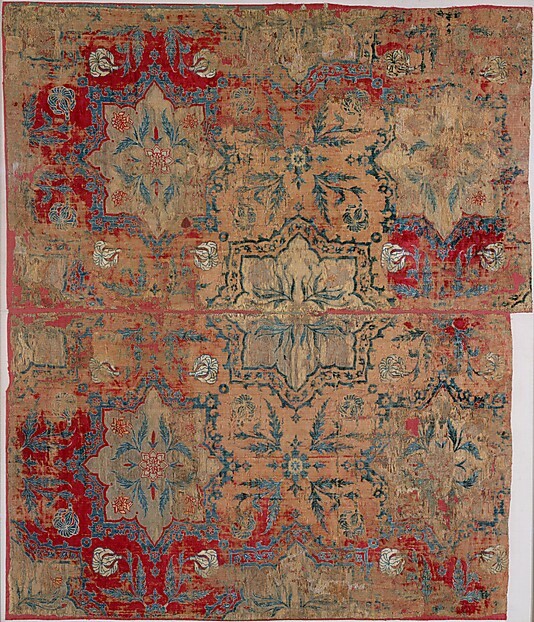 Increasing the suppleness and softness of the carpet, the greater number of knots also increased the subtlety of the patterns that could be made on the carpet; here, a scrolling vine from which bloom palmettes, poppies, irises and serrated lancet leaves. 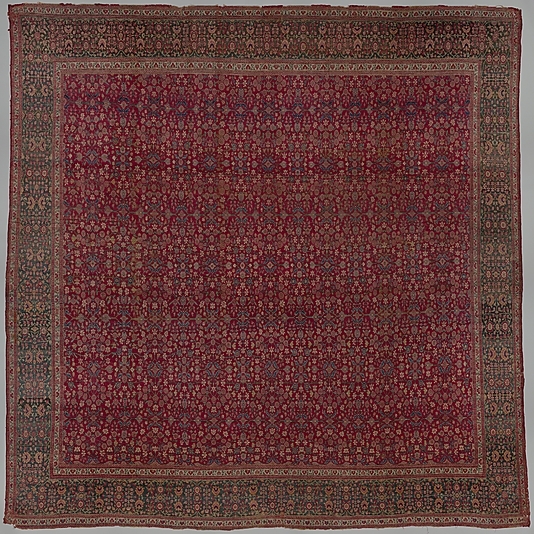 Pashmina wool, the undercoat of the Himalayan mountain goat, was obtained from Kashmir (in northern India) and from western Tibet, from which imports were strictly regulated. 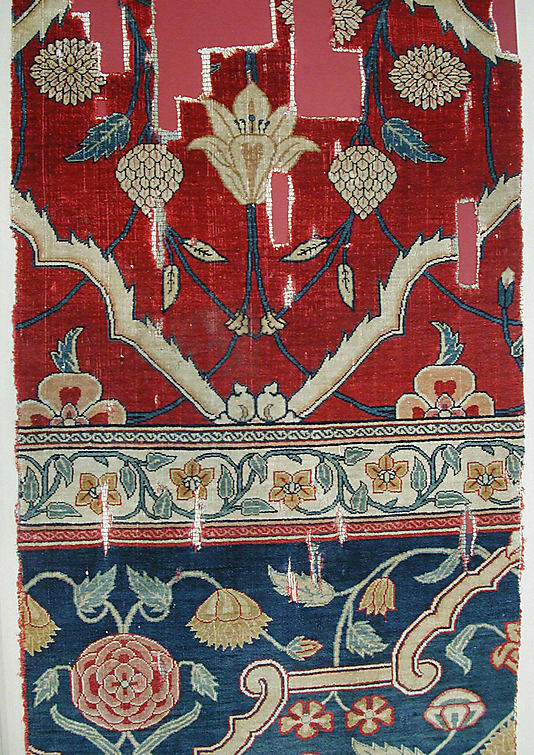 This carpet represents the highest level of production—imperial grade—made with an extremely fine weave and costly materials. 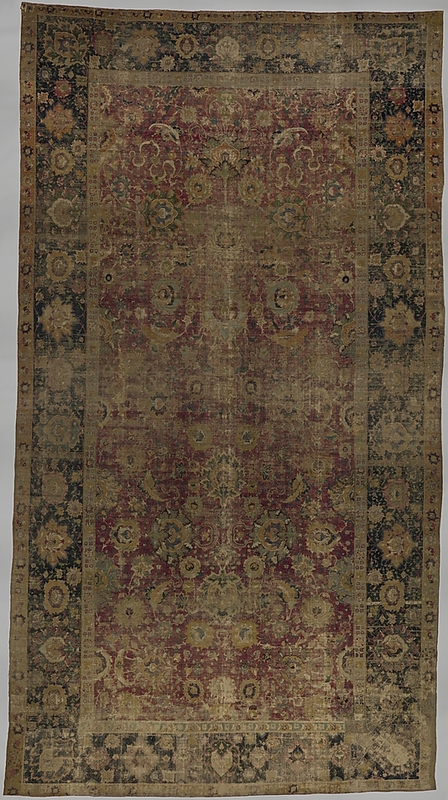 It looks and feels like velvet, but the pile is actually pashmina wool, made from the fleece of Himalayan mountain goats. 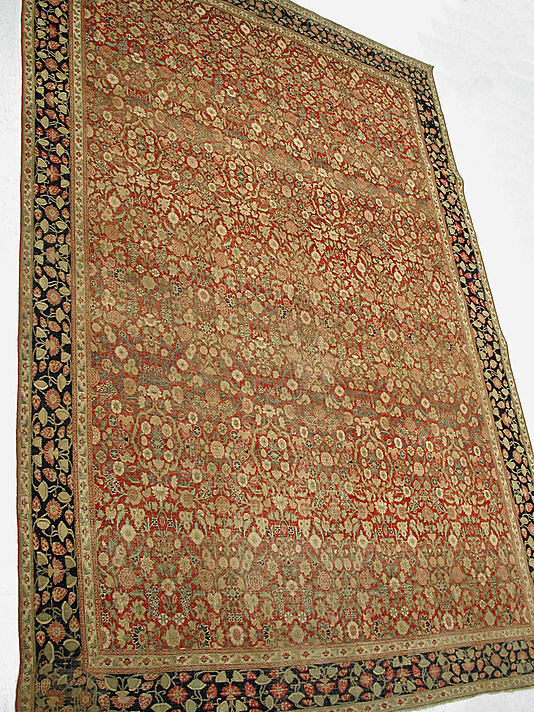 Its decorative style, with its floral forms, is typical of the Mughal emperor Shah Jahan’s taste, seen also in the architectural ornament and manuscript illumination produced during his reign. 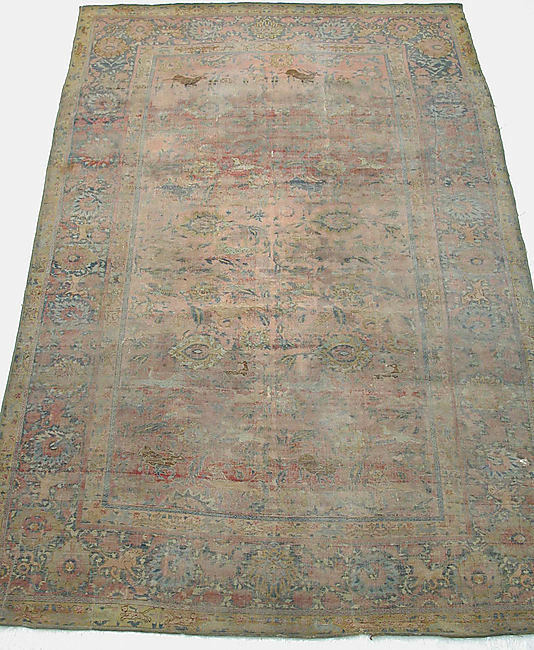 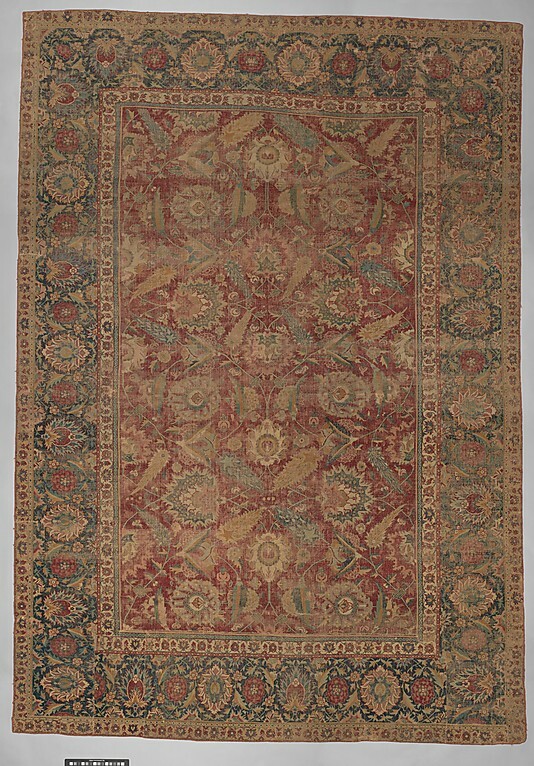 These fragments constitute about one quarter of the original carpet, which was over twenty-three feet long, an enormous size for a carpet of this quality. 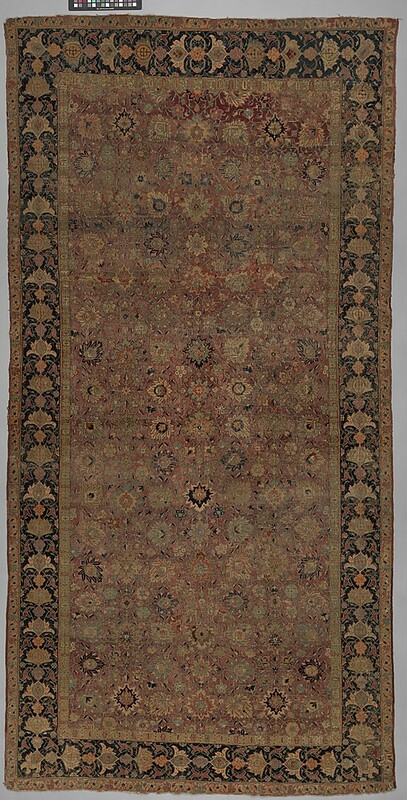 L. 11 1/2 in. 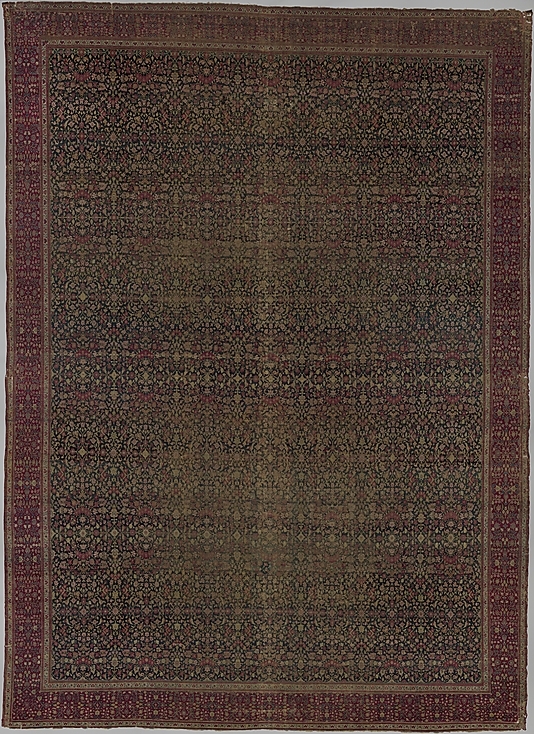 x W. 9 1/2 in. 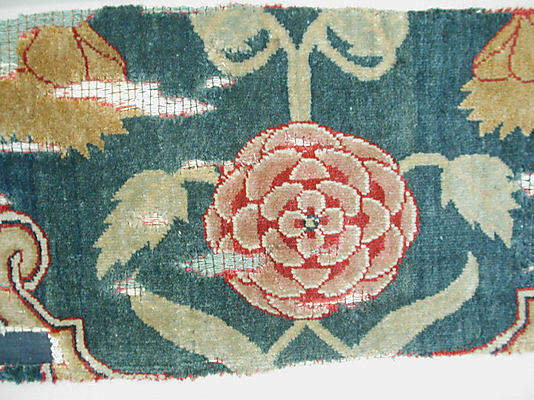 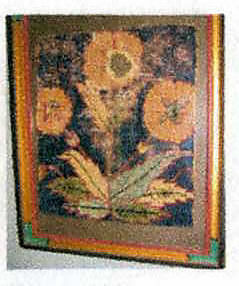 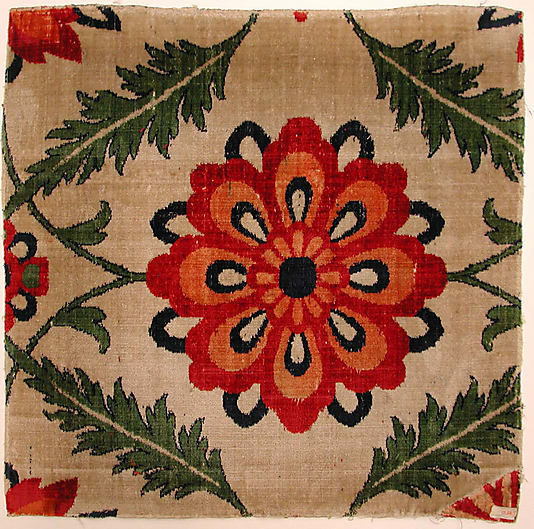 This weaving is part of a group that uses the most popular motif of the emperor Shah Jahan’s reign: the single flowering plant, in this case a poppy, set within a niche. 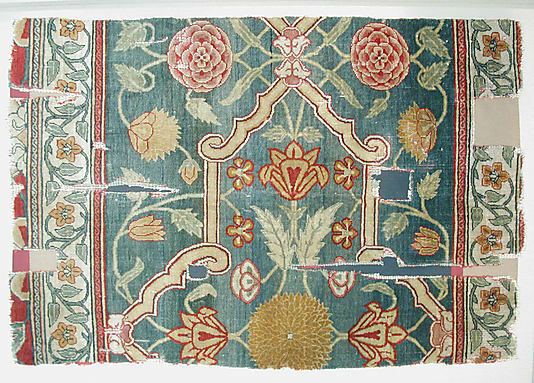 The similarity of their design to tent panels with niches and to hangings shown in royal audience scenes suggests that they were hung vertically rather than being placed on the floor. 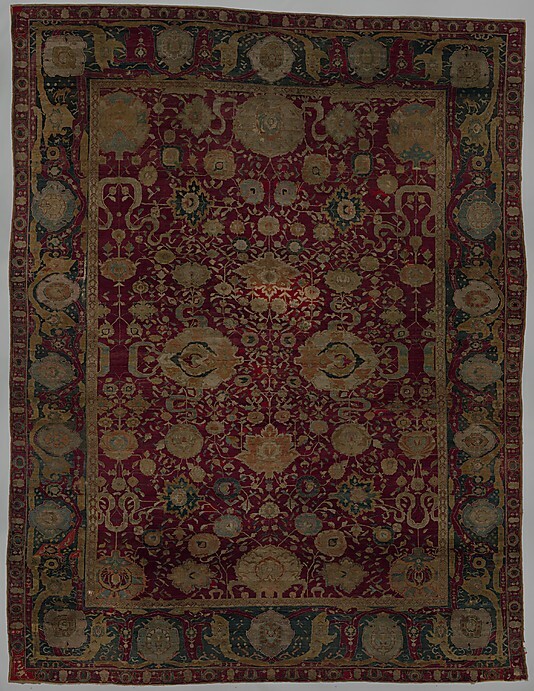 For special occasions, Mughal palaces and pavilions were spread with silk hangings, carpets, and embroidered velvets. 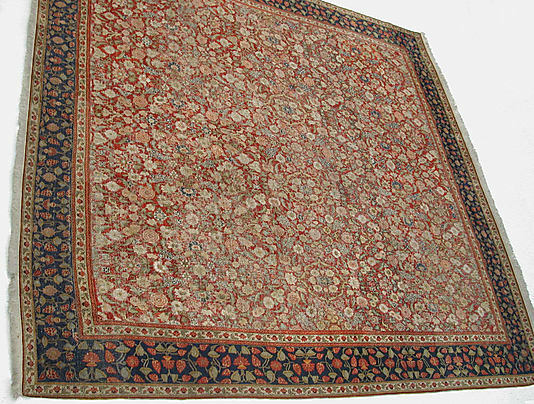 On one New Year’s Day, for instance, the emperor Jahangir mentioned visiting his vizier and brother-in-law Asaf Khan, who had covered the road from the palace with velvets woven with gold and gold brocade. 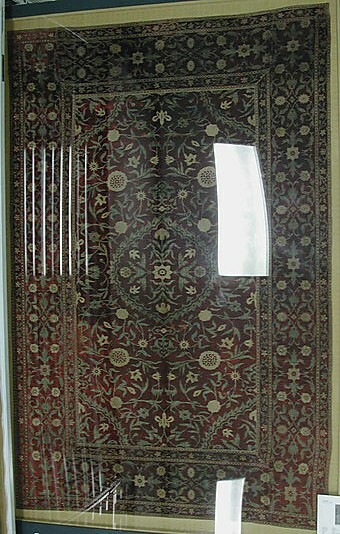 This sumptuous carpet may have been used for such an occasion. 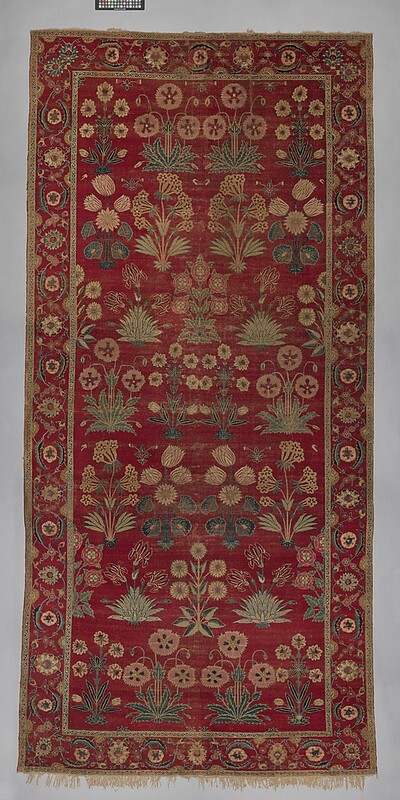 Its design is reminiscent of Iranian textiles, but ink inscriptions in Gujarati script on its selvages indicate that the carpet was woven in that state, which was well known for the production of silks, velvets, and cottons.